I have enjoyed this chatni at my house as long as I remember. The ‘lasan ke chatni’ goes great with pulao, daal/chawal, anda/paratha and basically anything in the world! After many requests by you all here is the recipe of the delicious ‘Lasan ke Chatni’. Put the garlic cloves and lal mirch in a grinder and add salt to taste. Now add a tomato and some coriander and grind to a paste. Fry the cumin in the oil and once it changes color add the chatni paste. Fry the chutni for 1-2 minutes. Leave to cool. You can bottle up this chutni and keep in your fridge. Serve cold. This chatni is always ready in my ammie’s house and is a staple with all meals. Garlic is great for digestion too and the chatni adds a great kick to any dish. I have been sharing glimpses of our vacation in Islamabad these days via Instagram stories which of course includes the delicious food! A lot of you requested the recipe of the chatni after seeing it regularly in my stories. We eat this chatni at breakfast, lunch and dinner too! 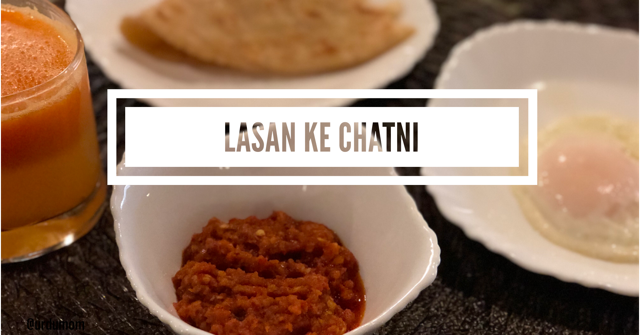 Hope you enjoyed this ‘Lasan ke Chatni‘ recipe and try making it at home. Chatnis are a special part of all South Asian dishes. There are many variations of chatnis based on ingredients, flavors and occasions. Many houses consider a meal incomplete without a chatni accompanying it. Do you have a special recipe in your family or one that has been passed down for generations? I would love it if you share those! I m also belongs Urdu speaking family.offen used to make this chatni,I like this chatni.realy loved your stories.